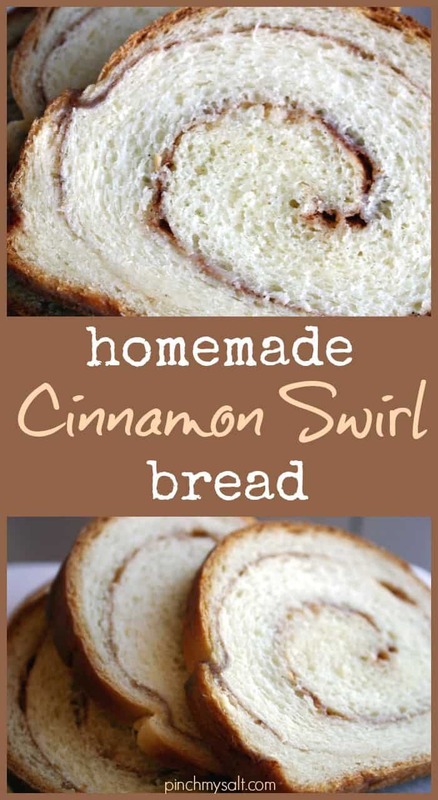 This homemade cinnamon swirl bread is better than anything you can buy at the store and makes the most perfect cinnamon toast. Although I love to eat it still warm from the oven, I think it tastes just as great the next morning, toasted and slathered with butter. I’ve been baking bread since I was small. 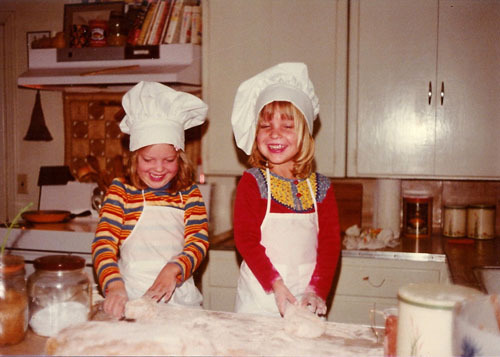 My mom baked bread a lot when we were kids and my sister and I used to have fun helping (dressed in our matching chef’s hats and aprons, of course). Here I am on the left (Nickle, back then) and my sister Penny is on the right. At some point, I took things into my own hands and started baking my own bread. 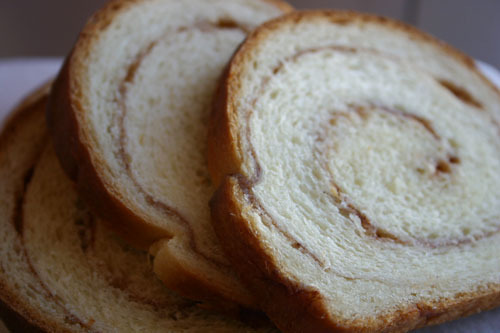 Cinnamon Swirl Bread, to be exact. For whatever reason, once I learned how to make that, it was the only bread I made for years. It wasn’t until we moved overseas a few years ago that I was bitten by the bread making bug (actually, attacked is more like it). I will never stop making the cinnamon swirl bread but I’ve since branched out into all types of bread from standard whole wheat sandwich loaves to focaccia to sourdough (my latest obsession). There is nothing in the world like the smell of bread baking in the oven and few things more satisfying than cutting into a loaf of cinnamon swirl bread and knowing that you created it with your own two hands. Here is my old standby Cinnamon Swirl Bread recipe, adapted from the Better Homes and Gardens Homemade Bread Cook Book (1973). 1. In large mixing bowl or the bowl of a stand mixer combine 3 1/2 cups of the flour and the yeast. In a saucepan heat milk, 1/2 cup sugar, shortening or butter, and salt just until warm (115 to 120 degrees), stirring constantly to melt shortening or butter. Add milk mixture to dry mixture in mixing bowl then add eggs. Beat at low speed with electric mixer for 1/2 minute (or in a stand mixer using the paddle attachment), scrape down sides of bowl, then beat 3 minutes at high speed. By hand, stir in enough of the remaining flour to make a moderately soft dough. (If using a stand mixer, gradually add flour until a moderately soft dough forms, then switch to the dough hook.) Turn out on lightly floured surface and knead till smooth and elastic, 5-8 minutes. (Knead with dough hook in stand mixer for 5 minutes on medium-low speed.) Shape into a ball. Place in lightly greased bowl, turning once to grease surface. 2. Cover and let rise in a warm place until double in size (1 to 2 hours). Punch dough down; turn out on a lightly floured surface. Divide in half. Cover; let rest 10 minutes. Roll each half into a 15x7-inch rectangle. Brush entire surface with water. 3. Combine the 1/2 cup sugar with the ground cinnamon. Spread each rectangle with half the sugar-cinnamon mixture. Roll dough up, beginning with narrow side. Seal long edge and ends by pinching together. Place, sealed side down, in 2 greased 9x5x3-inch loaf pans. Cover and let rise in warm place till almost double (about 45 minutes). Bake at 375 degrees until done, 35 to 40 minutes. (If crust browns too quickly, cover with foil last 15 minutes of baking.) Remove bread from pans and cool on wire racks. My favorite way to eat this cinnamon swirl bread (other than right out of the oven with tons of butter) is toasted with tons of butter. This recipe makes two loave, so enjoy one loaf and give the other one to someone special. « Spice Up Your Spring! Oh, that looks so good. And I bet it smells divine! looks very nice! I love the way the bread "rolls"
Hi! I live in Brazil and I'm simply nuts about cinnamon. I tried this recipe yesterday and couldn't wait to let you know that it's fantastic!! 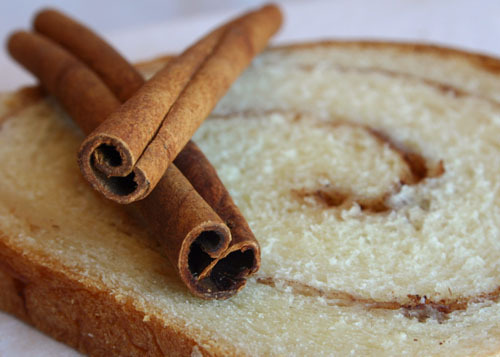 The bread is delicious, very soft and the center part, with the cinnamon, is amazing! Tks for sharing this wonderful recipe with us!P.S. : your blog is so nice! Patricia, thanks so much for stopping by to let me know you made the bread! I love sharing recipes and the best part is hearing what other people think! Those cinnamon muffins on your site look wonderful! I would think the sticks are just for decorative purposes only! The recipe SAYS ground cinnamon.And thanks Nicole!! I have been looking for this recipe since I moved back in 1993!! I lost my book. The book at the library has a different cover and the recipe just isn't quite the same. Wonderful!!!! I made it last night and it was just like I used to make it!!! And at the last minute, I decided to try your 1/2 cup of butter instead of the 1/2 of crisco. I was glad I did! I had never tried it before and was a little afraid that it wouldn't rise as well. But they turned out to be large full loave with no air spaces!! It was perfect and I'm so glad you were generous enough to put this on this website so that I could find it after all these years!THANK YOU!!! Where in the world are you Nicole!!!!? :o) I just posted my last comment at 1:14pm Indiana time and the post says it was posted at 7:14PM! Are you in England or some place? 6 hours time difference.Okay, I looked around the site and saw that you are in Sicily!! !I also made a 37 page cookbook two years ago. I made it for my niece who likes to come over around the holidays and help me make candy for Christmas. It has photos of the finished product along with the recipes, but also I incorporated family photos over the years on the pages (specific to that recipe). My mother (her grandmother) passed away in 2004 and I made the cookbook for her for her 2005 birthday. I have printed out the pages for myself, but I'm a procrastinator when it comes to things for myself. I made digital pages and put them in a digital scrapbook. All of my favorite recipes I gave her so that they won't die with me!!! I want to have pages in MY cookbook with recipes and pictures that friends have given me. It is strictly a personal cookbook. May I put your picture on the page with the cinnamon bread? I like to remember where the recipe's came from and in this case, where the recipe RESURFACED from!!!! Thank you for inviting us into your kitchen. The cinnamon bread was wonderful~ but somehow I ended up with flour all over. 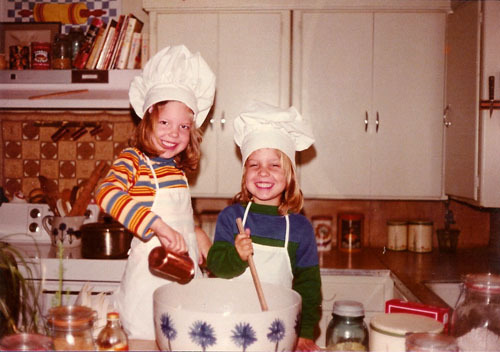 Those were some precious future cooks! I really should try baking bread one of these days! How can someone who grew up like us not make homemade bread?! well I guess Penny and I got left out when it came to the family cooking gene! I know your mom would love Pinch My Salt! I love you! keep on baking! I've had a stack of "maybe" recipes lined up for my next Saturday morning. I think this one has moved to the top of the stack. The picture is beautiful, and I can only imagine how good that bread must smell! Hi Nicole You are ur sis looks cute with that chef hats. Pictures looks great and recipe too. One of my favorites! Do you like butter, by any chance? So tell us, does your birth certificate say Nickle? Don't be shy...Hippie. I guess that's why we love our mom's, they are so creative. I know a guy named Wonderful, and a girl named Sunshine...I can just smell the patchouli. This is one of the best blogs entries ever. It incorporates your life and recipes. I love it. Although subtle, it is such a tribute to your mom--who we all learned from and loved. And memory--when we were roommates in Oregon--I distinctly remember coming home from work and walking in the living room, where the kitchen table had been moved--covered w/flour--and then you came out from the kitchen w/flour on your face--and of course the wonderful aroma of the cinnamon bread--yummy. It was the best--no lies everyone--this is one friend that knows, this woman can cook!!! Friend #2 knows this woman can cook. Heeheehe Oops--let me correct myself--I am one of many friends of Nicole, that knows she CAN cook, bake, etc. :) Nicole you have a fan club for sure. And who would have known, the meals/treats/ noodles/snacks you made in the past..would be so memorable today w/all of us. And now you are basically sharing it with the world. That looks like a wonderful breakfast bread. I'll have to give it a try next time I have a free Saturday. Would anyone know how to convert this recipe to be used in a bread machine? Crystal: I've never used quickrise yeast, so I'm not sure whether you would need two packages or only one. Does it say on the package whether it can be substituted one to one for regular active dry yeast? Hi there. Nope, it doesn't say that. It does however say it is 2 1/2 tsp worth of yeast. I used 2 and it worked out great. We ate it while still hot, beautiful texture and nice and sweet. YUM!!! Thanks so much. This looks preposterously good. What a lovely tribute to your mom. Hi, have you ever made this in a bread machine? I've gone back to work full time and working on my master's. I've recently bought a zojirushi bread machine and wondering if I could use that to make this recipe. The recipe looks yummy!! This is just one of the many cinnamon swirl breads I've made recently in an attempt to solve the persistent problem of large gaps around the swirl, and in some cases a significant gap between the top crust and the bread. This is the best so far. There was still a slight separation around the swirl in some places but no gap under the top crust. The bread is more soft and tender than some cinnamon breads and makes delicious toast. One comment about the yeast - the recipe calls for 2 packages active dry yeast or 2 teaspoons instant or rapid-rise yeast. One package of active dry yeast is 2 1/4 teaspoons. Two packages would be 4 1/2 tsp of active yeast. I've found that in most bread recipes instant yeast is subbed for active yeast in the same quantity. Is the 2 tsp instant yeast a misprint? I made a half recipe and used 2 1/4 tsp instant yeast and it was fine. Sadie, I'm not sure why I didn't see this comment, but you were right! It should have been 4 teaspoons of instant yeast. As I'm going back and updating old blog posts, I noticed the error and corrected it. I'm sorry for the extremely late response!